Here are five more affordable, special edition cars that’ll help you stand out from the crowd. 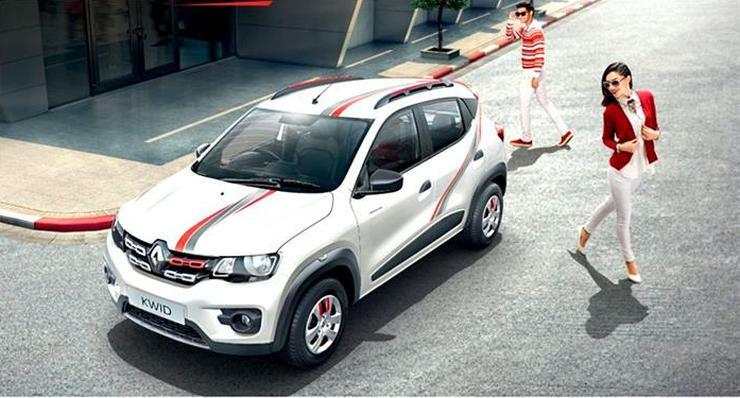 The Kwid is Renault’s biggest success in India, and the small car continues to sell strongly. The ‘Live for More’ edition of the Kwid adds some exclusivity. Prices at Rs. 2.93 lakh (ex-showroom, Mumbai), the new edition gets a new steering wheel cover with red stitching and red inserts on the door pads. On the outside, the car gets a contrast-coloured roof-mounted spoiler, grey and red graphics along the bonnet, roof and doors, along with red accents on the grille, wheel covers and roof rails. The 800 cc and 1 liter, 3 cylinder petrol engines, and 5 speed manual and AMT options remain unchanged. India’s best selling sedan will soon be replaced by an all-new model. While the new Dzire is a few months away, Maruti has begun clearing stocks of the current model. The Allure package edition is one such move. Chrome accents, new body graphics, tweaked bumpers design and an ‘Allure’ badge on the trunk lid are the various changes. The insides get faux wooden accents, two tone seat colors, front central arm rest, new floor mats, leather wrapped steering wheel cover, door sill guards and ambient foot well lighting. A Hertz music and speaker system is optional. 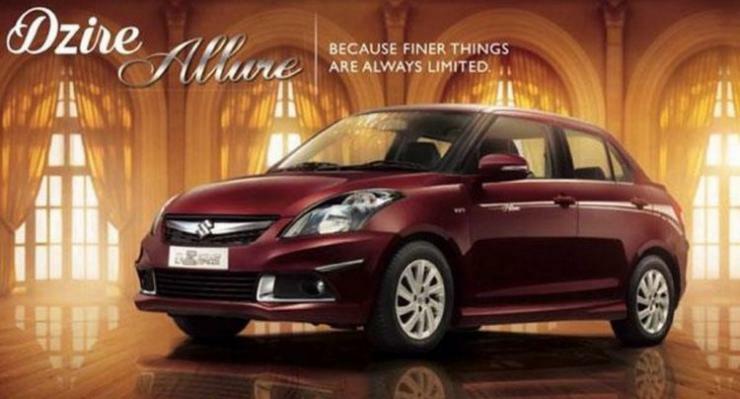 The Allure package can be added to any Dzire compact sedan variant sold in India. Volkswagen has given the Vento a mild makeover. The refreshed car is called the Vento Crest, and comes with a bunch of styling touches and creature comforts. On the outside, the car gains a contrast roof, boot spoiler, crest badge on the C-Pillar and flank decals. On the inside, detachable sun blinds, seat covers, front arm rest, textile mat and door step garnish are the various changes. Under the hood, the 1.5 liter TDI turbo diesel, the 1.2 liter TSI turbo petrol and the 1.6 liter naturally aspirated petrol engines remain unchanged. Contact your nearest VW dealer for prices. 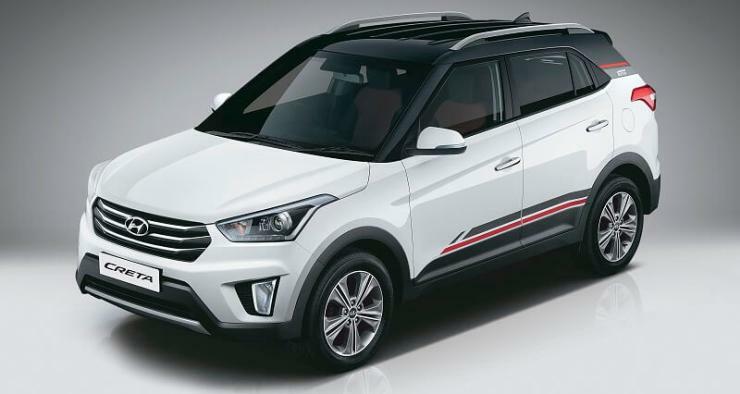 Hyundai is having a dream run with the Creta compact SUV. To celebrate the vehicle’s first year in India, Hyundai has introduced the anniversary edition. Available with the 1.6 liter petrol and turbo diesel engines, and with the SX+ trims, the anniversary edition model starts from 12.24 lakh rupees. In terms of features, it gets a two-tone colour scheme with black roof and white body and sporty graphics, 17-inch diamond cut alloy wheels, an all-black dashboard with red accents, premium black seat fabric with red inserts, a 7-inch touchscreen AVN system, and leather-wrapped steering wheel with audio and Bluetooth controls. The popular Ford Ecosport gets a bunch of additions, to make it look and feel good. All black interiors, blacked out grille, ORVMs and alloy wheels, daytime-running lights (DRLs) placed just under the fog lamps, front and rear bumper appliques, body graphics with EcoSport branding on the doors and illuminated scuff plates are the changes on the outside. Moving in, black vinyl seat covers with red stitching is the major change. Prices for the Ecosport Black edition start from 9.26 lakhs, ex-showroom Delhi.